If I had to describe in one word the summer of 2016, that word would be-DRY! And that feeling is supported by data from the Climatological Report issued by the National Weather Service which states that rainfall in the Burlington area so far this year is 6.5 inches below normal. The effects on the wildlife have been readily observed. I haven’t seen but a few Wood Frogs hopping through the forest, and I usually see dozens throughout the summer months. The few times it did rain, a few days later the forest floor would be covered with numerous species of mushrooms of various colors including, orange, red, yellow, purple, white, beige, brown, and green. It was as if the mushrooms knew they would have but a few opportunities to produce their reproductive structures, and took advantage of those few heavy rains and moist soil to do so. And I had never seen Rocky Pond lose so much water due to evaporation. The creek runoff was just not there to offset the evaporation loss. On the first day of summer I was treated to the beautiful call of the summer tanager on Crusher Road, a call I would hear for weeks in that area. Summer tanagers did very well this summer. 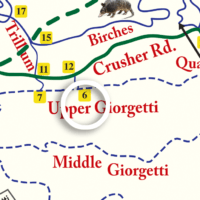 They were heard on a regular basis on Crusher Road, near trail marker 24 on the Carriage Trail, and in the area between Rocky and Muddy Ponds. 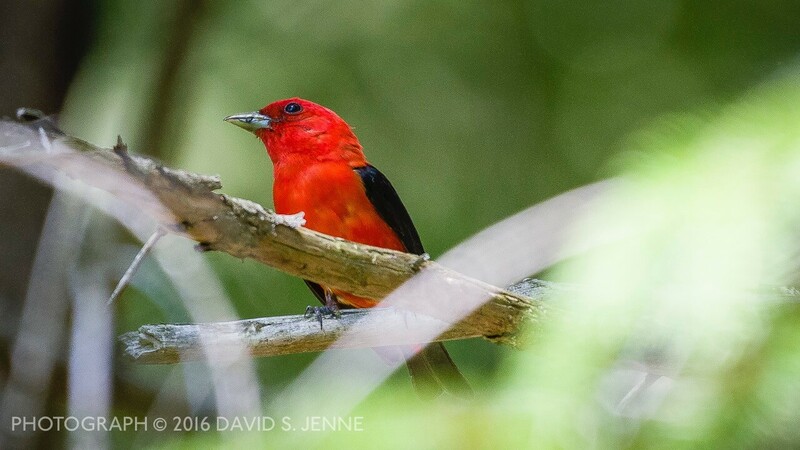 This was definitely the best year yet for nesting scarlet tanagers. This time of year, an early morning stroll on one of the Pine Hill Park trails would have you hearing scarlet tanagers, pileated woodpeckers, yellow-bellied sapsuckers, hermit thrushes, ovenbirds, Eastern peewees, American redstarts, robins, northern flickers, yellowthroats, veery, catbird, tufted titmouse, wood thrushes, crows, blue jays, red-eyed vireos, white-breasted nuthatches, yellow-breasted vireos, and black-capped chickadees. Near the ponds you would likely hear mourning doves, the call of osprey, belted kingfishers, song sparrows, and the occasional calls of great blue herons. New flowers were starting to appear including thimble weed, whorled loosestrife, northern bedstraw, yellow wood sorrel, partridge berry, rough-fruited cinquefoil, hop clover, cowwheat, and common milkweed. Butterflies included Eastern tiger swallowtail, white admiral, and red admiral, Easterntailed blue, cabbage butterfly, and great spangled fritillary. The chestnut trees are doing quite well. There are now 2 different populations of American chestnuts growing at Pine Hill Park. They are marked with the red flags which you may see on certain trails, especially above the quarry on Crusher Rd. They come from populations of wild American chestnuts which have been producing nuts for decades, and which MAY be naturally immune to the Chestnut Blight Fungus. 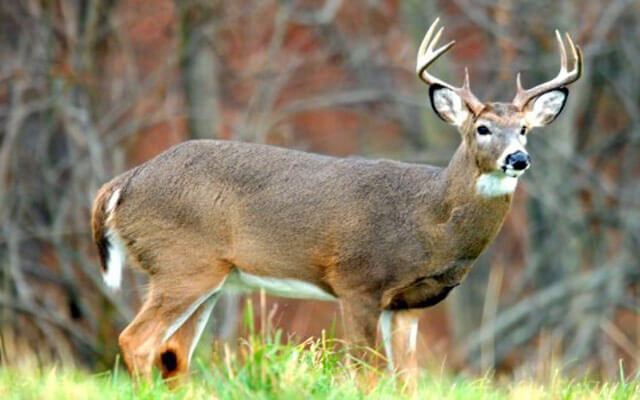 These stands are located in Georgia and Wisconsin. During the last week of June, I saw schools of hundreds of tiny horned pout fish at Rocky Pond, while along the shores you could see and still hear bullfrogs, green frogs and gray tree frogs. Barred owls have also done very well this summer at Pine Hill Park. Owls were either heard or seen at numerous places in the park, more so than in previous summers. You’re more than likely to hear them “hooting” at Rocky Pond if you go there at dusk. 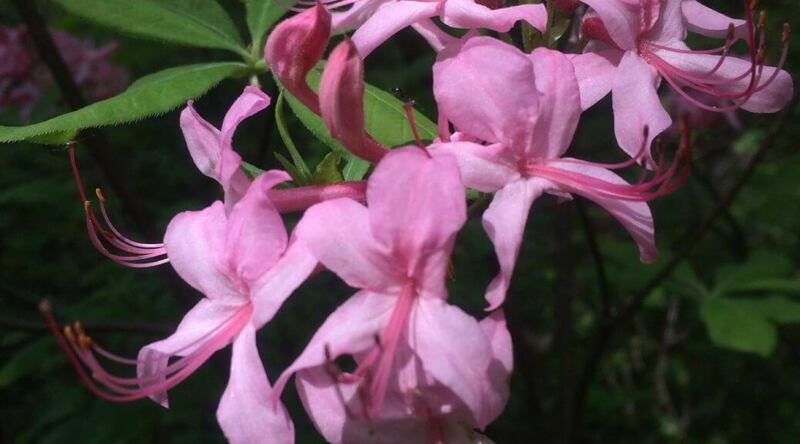 This time of year, new flowers are replacing those which had bloomed a week or two before and are now gone. At the end of June, purple-flowering raspberry, heal-all, common mullein, shinleaf pyrola, and black-eyed Susan’s were new blooms. The first week of July found yellowthroats nesting on Crusher Rd. as they have done in the past and blueberries ripe for the picking. New blooms included tick trefoil, meadowsweet, white avens, deptford pink, garden loosestrife, St. John’s-Wort and Indian Pipe. The Indian Pipes seemed to all emerge at the same time-the day after a heavy rain. 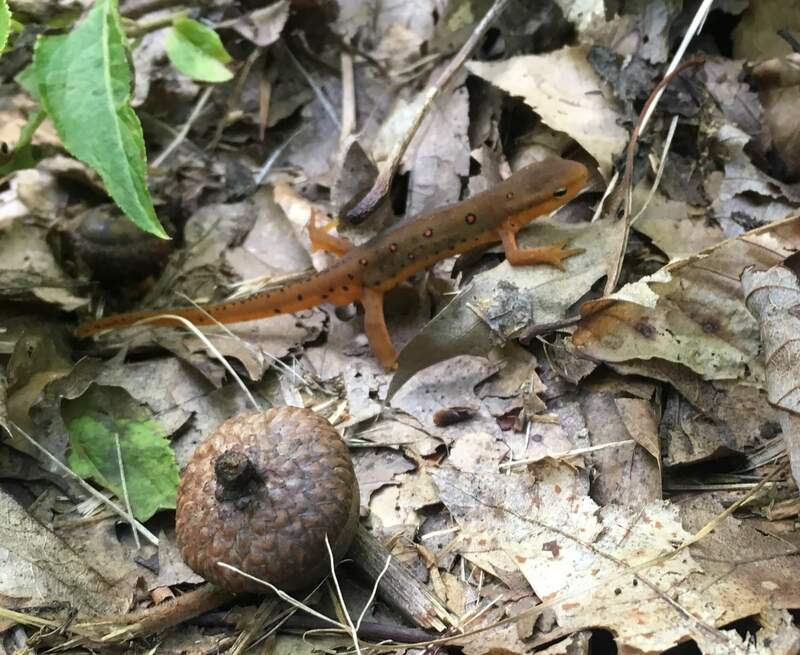 Red efts, of course, is always a common sight on the trails after a good rain. That rain also brought out one of the only times I saw wood frogs in the forest this summer. This is the time of the year where you’re also likely to see the beautiful, iridescent blue-colored tiger beetle on most of the sunny trails. But be careful, they can give a nasty bite if handled. In mid-July you could see adult and young wood ducks on Muddy Pond, cottontail rabbits on Crusher Rd., agrimony, hedge bindweed, white sweet clover, queen Anne’s lace, goldenrod and helleborine all in flower, baby painted turtles and black water snakes at Rocky Pond, and white-andblack and chestnut-sided warblers. On July 12th, while sitting at Rocky Pond very early in the morning, I heard a black bear huffing and growling on the north side of the pond. I believe it was calling its young. Towards the end of July, wood nymph butterflies were becoming a common sight on my walks, evening primrose and touch-me-not was flowering, and the forest was becoming increasingly quiet. A male AND female indigo bunting was seen on the carriage trail, and by the way they were behaving, I’m sure they were close to their nest. I’ll be watching and hoping for their return next year. 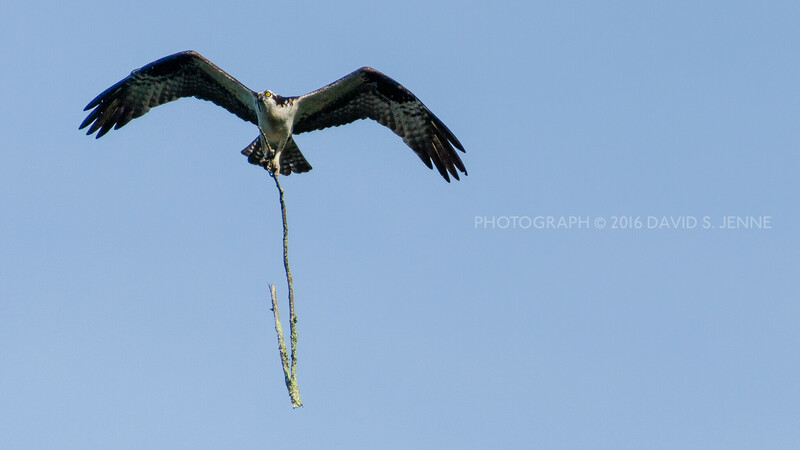 An Osprey carrying sticks to a power pole in Muddy Pond this past June. Photo by David Jenne. A pair of osprey at Muddy Pond were being seen on a regular basis. Though they built a temporary nest on the top of one of the electrical wire poles, they would never spend any appreciable amount of time on that nest. Inevitably, they would take flight in the direction of Proctor after spending a few hours at the pond. But, I would not be surprised if they built an active nest at the pond next spring. They have their privacy, food and water at Muddy Pond, and have spent a lot of time there this summer. There are now 2 active beaver dens on Rocky Pond. Beaver have been seen leaving and entering both dens. The Rocky Pond beaver dam was removed due to the danger of it collapsing and then flooding Muddy Pond which could then pose a danger to the Muddy Pond dam which protects the golf course from flooding. But, the beaver continue to repair/rebuild the removed dam, and will continue to do so as long as they’re in their dens on Rocky Pond. 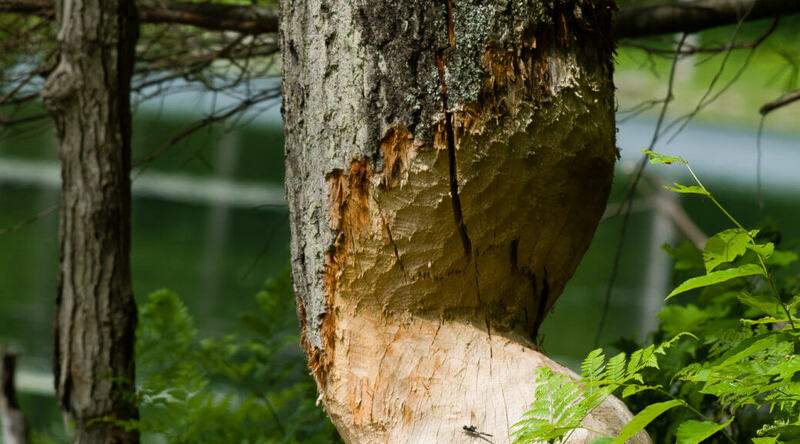 The Rocky Pond beavers are now busy storing their winter supply of stems and branches just outside their dens, preparing for the long winter ahead. At the end of July, a rufous-sided (Eastern) towhee could be heard singing on crusher road, and near the powerlines on the Carriage trail, cedar waxwings were becoming a more common sight, acorns started falling from oak trees, satyr butterflies were seen for the first time, Joe-pye-weed was blooming, and the forest was becoming so quiet that on some walks I heard or saw only a handful of birds. The beginning of August saw silver spotted skippers, pearl crescent and white admiral butterflies, American goldfinch, broad-winged hawks, black-throated warblers, and a double crested cormorant at Rocky Pond, and the first loose associations of black-capped chickadees, tufted titmouse, and whitethroated nuthatches. Black berries were ripe for the picking. While waving a red flag in my face, attempting to swipe away mosquitoes, a ruby-throated hummingbird flew up to the flag and hovered a few seconds before realizing it wasn’t a flower, and then flew away. Mid-August saw the first appearance of ringlet butterflies, the Eastern peewee changing its song to its late summer “tur-ee” song, and my first sight of a ring-necked snake. A few weeks later, I would see my first milk snake in the park. I can’t help but wonder if the lack of precipitation had something to do with the increased number of snake sightings I observed this summer. 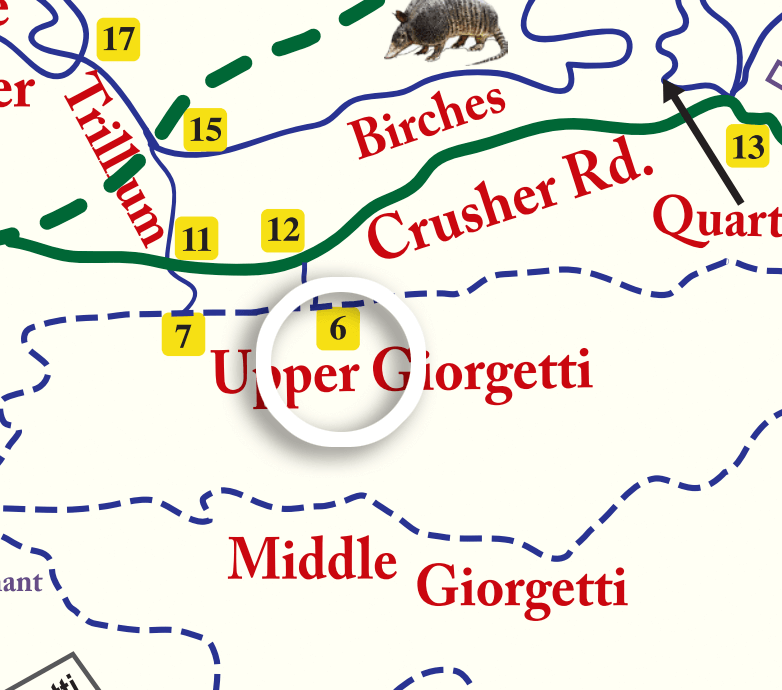 On Sept. 1st, I took a short hike along middle Giorgetti Trail and didn’t hear or see a single bird. The first week of Sept. saw turtlehead, and bottle gentian flowering, clouded sulfur butterflies, and acorns continuing to drop. This summer has been a bumper crop for acorns, and squirrels and chipmunks have been observed storing the nuts throughout late summer. Mid-September found some trees (mostly birches) beginning to lose their leaves, the first pair of Canada geese to arrive at Muddy Pond during their fall migration, and gray tree frogs croaking to one another. On the last day of summer I walked up to Muddy Pond and saw gray squirrels and chipmunks collecting acorns, I was surprised to see 3 hermit thrushes (which I hadn’t seen for weeks), and numerous robins flying through the forest on their migration south, and 9 Canada geese and 3 female wood ducks at Muddy Pond. I’m always amazed at how quiet the forest has become. Though I can see the fall changes in the plants and animals, it just doesn’t FEEL like fall yet. Where’s the cool north wind signaling the arrival of fall? 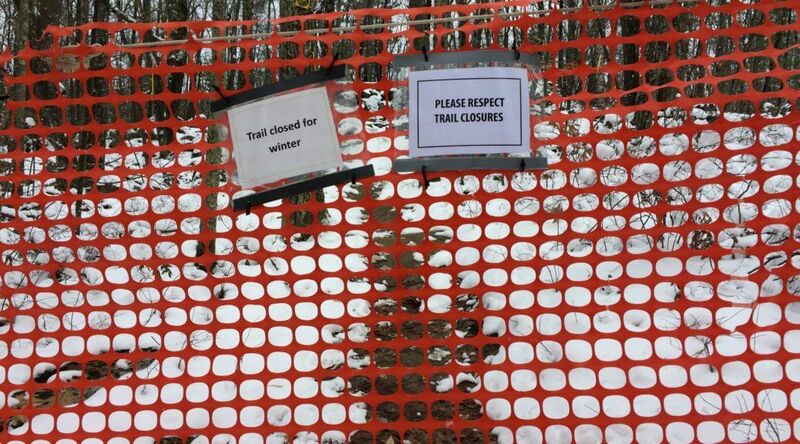 Enjoy your walks in the park, but please stay on the marked trails. AND, make sure your try some of the Redfield Trails-beautiful, peaceful, and lush trails which take you through the thick of it all. The first day of spring was the first time in 3 and a half years that while hiking from Giorgetti Rink to Muddy Pond, I did not see nor hear a single bird! But, Muddy Pond itself was a different story. Paired wood ducks, mallards, Canada geese, common mergansers, and a belted kingfisher were all seen, along with painted turtles sunning themselves. Near the intersection of Carriage Trail and Redfield Farm Trail could be heard a pair of barred owls “hooting”. The last week of March was quite different with cardinals, song sparrows, northern flicker, Eastern phoebe, black-capped chickadees, white-breasted nuthatches, golden-crowned kinglets, and tufted titmouse singing, while hairy woodpeckers, yellow-bellied sapsuckers and pileated woodpeckers were drumming. Crows were harassing a young bald eagle flying over Muddy Pond, while pairs of wood ducks and Canada geese were exhibiting behaviors associated with next building on Rocky Pond. The first wildflower of the season-Coltsfoot was observed, as was a mating pair of Eastern newts. The beginning of April saw the first appearance of robins in the park, with turkey vultures flying overhead. Countless trout lily leaves were also seen emerging from the forest floor throughout the whole park. Spring peepers were heard for the first time, and leaf buds were starting to appear on many forest trees. Snow flurries were becoming fewer in number, with only thin patches of snow appearing here and there. 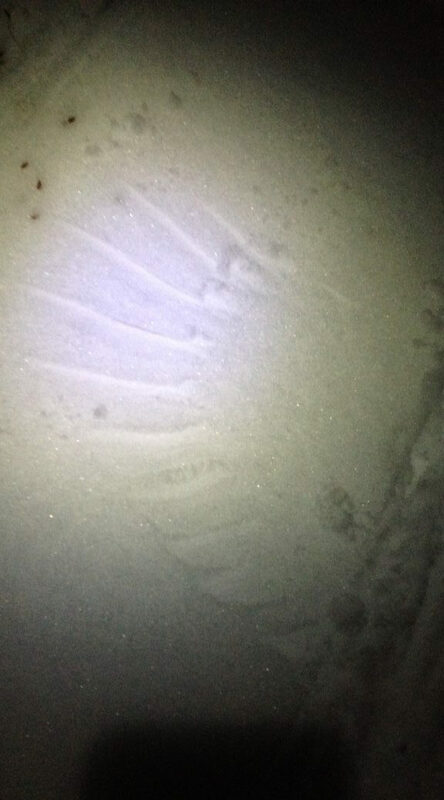 A pair of Canada geese were seen nesting in an isolated cove on Rocky Pond, and Bobcat tracks were seen by Shelly Lutz and Lauren White near the intersection of Stegosaurus and Redfield Trails. And this sighting happened just a few days after both of them had taken a wildlife tracking workshop. Ruffed grouse could be heard drumming in a few places in the forest. Rocky Pond water level continued to rise due to the increasing size of the beaver dam at the outlet of the Pond. Mid-April was a time of colder temperatures and an increasing number of flurries. Frog calls decreased substantially with the declining temperatures. The hermit thrush was seen for the first time this season, Canada geese continued to sit on the nest at Rocky Pond, and Wood ducks were a common sight on Muddy Pond. Mourning doves could be heard “cooing” at Rocky Pond, and wood frogs could be heard croaking. Tadpoles were seen swimming at Rocky Pond for the first time this season. Bumblebees (there are 18 species in VT) were a common sight, along with large numbers of other small flying insects. Anglewing butterflies were seen above the old quarry along with mourning cloak butterflies. The beautiful blue iridescent tiger beetle (They have a nasty bite!) could be seen on the trails in large numbers. The spring migrating warblers were beginning to be seen with palm and yellow-rumped warblers being two of the most common. And garter snakes were seen for the first time. And, of course, with the arrival of the spring migrants, you have the arrival of their predators, especially the broad-winged hawk. Towards the end of April, chipmunks were a common sight, yellow-bellied sapsuckers were busy building nests, red-eyed vireos were back, and trailing arbutus(flowers usually hidden by leaves) were in flower. 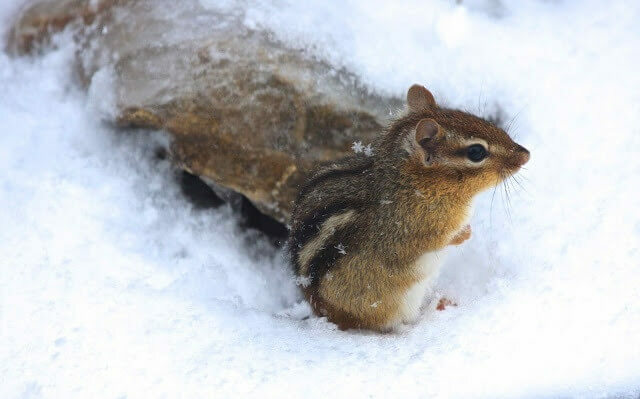 By this time of year, fern fiddleheads are emerging, chipmunks and squirrels are a common sight, Canada mayflowers are emerging from the forest floor, and the pair of Canada geese was still on the nest at Rocky Pond. New flowers were beginning to appear on a regular basis, along with new songbirds including the rufous-sided towhee and solitary vireo. Water level at Rocky Pond continued to rise with the increasing size of the beaver dam. The first week of May had me listening to the beautiful evening song of the hermit thrush for the first time this season, and Canada mayflowers were now becoming the dominant floor flower, replacing the declining Trout Lily. Blood root was beginning to flower. Had an early morning birdwalk on May 7th, and was surprised at how quiet the forest was. Thought I’d see and hear a lot more birds. Birds seen included: turkey vulture, cardinal, white-breasted nuthatches, yellow-bellied sapsuckers, crow, slate-colored junco, robins, American goldfinch, hairy woodpeckers, chipping sparrow, pileated woodpeckers, blue jay, tufted titmouse, black and white warbler, ovenbird, hermit thrush, Canada geese, mourning doves, wood ducks, and red-winged blackbirds. Wildflowers are starting to appear in large numbers, and new birds are starting to appear for the first time, including the black-throated blue warbler, least flycatcher and yellow-throated vireo. More and more trees are starting to “leaf out”, Lauren White saw a snapping turtle near the Rocky Pond beaver dam, and the geese at Rocky Pond mysteriously disappeared. I did receive an unconfirmed report that a pair of geese and two goslings had been seen at Rocky Pond towards the middle of May. Many wildflowers are in flower this time of year trying to beat the “leaf out” when they will be shaded, and the sunlight hitting their leaves decreases dramatically. 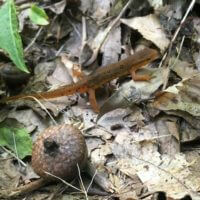 Saw my first Red Eft walking across a trail towards the beginning of May. In Mid-May, one could hear gray tree frogs croaking, or see Mourning Cloak, Juvenile’s or cabbage white butterflies throughout the forest, especially along the trails. Black flies were starting to become a nuisance, and I received the first of MANY reports of Osprey at both Rocky and Muddy Ponds. Light flurries were experienced as late as May 16th, the same date that I first observed flowering Jack-In-The-Pulpit flowers. Mid-May seemed to be the apex of bird activity this year. Many birds could be seen or heard on any day and still, new birds were arriving including, yellowthroat, great crested flycatcher, Eastern peewee, and scarlet tanager. Late May saw the forest explode with wildflowers including forget-me-not (the bridge area near the trailhead is covered with them), common buttercup, false Solomon’s seal, Solomon’s seal, star flower, wild lily-of-the-valley, wild columbine, pink lady’s slipper, common cinquefoil, bunchberry, slender blue-eyed grass, and clintonia. Saw my first VERY LARGE millipede on the trail near Muddy Pond. Hadn’t realized they were found this far north. On May 29th, I saw a black water snake swim past me near the Rocky Pond beach rocks, then smelled a dead animal from an area where it swam from. Looking more closely, I found 5 dead black water snakes of varying sizes, coiled up together. I was wondering if they had recently emerged from their nearby winter den too weak to hunt after fasting over the winter months. It appears Muddy Pond had THREE successful wood duck nests this year. Broods of 8, 6, and 3 were seen by numerous people, throughout May and June. With all the dead trees lining Muddy Pond, this is no surprise to me. Holes in the dead trees make perfect nests, and the proximity to water allows for fledglings to make a quick run to the relative safety of water and nearby adults. On the last day of May I saw a pair(female and male) of Indigo Buntings near Trail Marker #11, but haven’t seen them since. The first week of June had David Jenne emailing to Shelly Lutz (then forwarded to me), some spectacular pictures of Osprey at Muddy Pond. They’ve built a temporary nest on the top of the electric wire towers at the north end of the pond. They’ll go there to feed, but are not nesting. At least not this year. But, I’m going to make a guess that we are going to have a pair attempt to nest there next year. Maybe even take over the abandoned great blue heron nest on the East side of Muddy Pond. They’ve been a common sight at the pond, have been seen feeding there, and have been seen carrying twigs and sticks up to the temporary nest. I wait with great anticipation. Great blue herons have also been sighted at Muddy Pond, sometimes sitting on the old abandoned nest. They, too, are not nesting on the pond. The scarlet tanager is nesting somewhere around trail marker #11. While taking a group of Rutland Middle School students on a nature hike on June 7th, we were able to call in a scarlet tanager close enough for the students to get a look at one of the most beautiful birds in America. 19 more American chestnut trees were planted in Pine Hill Park this June. There are now 41 chestnut trees in the park. They are weeded, watered, sprayed (organic garlic oil) on a regular basis. For the most part, trees planted last year are doing quite well. A barred owl was seen and heard “hooting” every day for over a week towards the beginning of June just above the old rock quarry. Haven’t heard it there for a while. But, if you go up to Rocky Pond at dusk, you’re sure to hear them “hooting” on the far side of the pond, and see the beaver swimming back and forth from its dam. 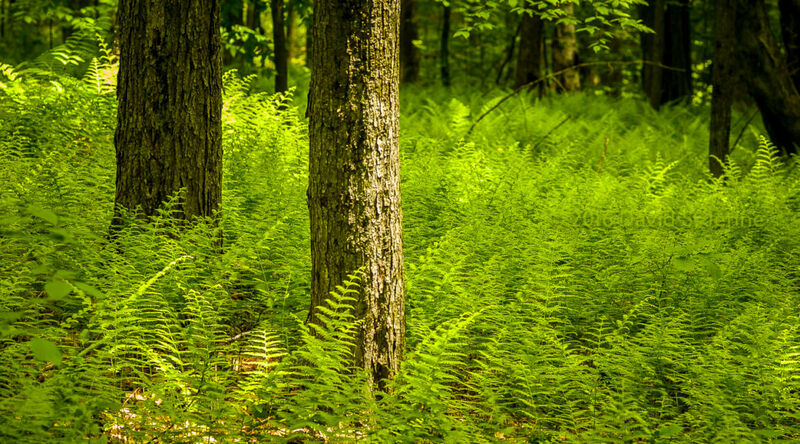 By mid-June, Christmas fern spores were maturing, fireflies were seen for the first time, and new butterflies were seen including red and white admirals, and the Eastern tiger swallowtail. New flowers continue to emerge (Stay away from the Wild Parsnip at Rocky Pond), garter snakes are seen on a regular basis, male deer are just starting to grow their antlers, the cottontail rabbit is once again feeding on the Crusher trail, and bullfrogs can sometimes be heard in chorus croaking, which can be VERY loud, when dozens are croaking at the same time as commonly happens this time of year on Muddy Pond. Black flies are having a field day, with mosquitoes and deer flies trying to get their share of our blood. That’s it for this season. Hope you’re all enjoying your time at Pine Hill Park. Please stay on the trails, and don’t hesitate to email me (testill@cksrutland.org) with any interesting wildlife sightings. I’ll be sure to put them in my next summary.